Tomb of St Nicholas (Santa Claus). Photo Credit: Wikipedia. Irish grid reference: S 5679 4042. In the old churchyard at the west-side of the ruined medieval church of St Nicholas at Newtown Jerpoint, Co. Kilkenny, stands the medieval carved gravestone, reputed to be where the remains of St Nicholas of Myra (yes, the original Santy, St Nick, Santa Claus or Klaus), were laid to rest here back in the year 1300 and, a beautifully carved graveslab was placed over the saintly bishop’s remains. The legend says that St Nicholas’ remains were brought back to Ireland from Bari in Italy by two knight-crusaders of Irish/Norman birth, although [the] church dedicated to the saint was already established at Newtown Jerpoint at that time. There is also a holy well named after the saint. St Nicholas’ ruined church with its famous medieval gravestone is located (on private land) 2 miles south-west of Thomastown, just west of the Little Arrigle river and the N9 (R448) road, at Jerpoint Park. The monastic ruins of Jerpoint Abbey are about half a mile to the east; while sadly the village of Newtown Jerpoint was abandoned in the 1680s and the church left to fall in to ruin and decay. Kilkenny town is 13 miles to the north-east. The story goes that in the 13th century two Irish knights (both known as De Fraine) on their ‘retreat’ back from the crusades in the Holy Land stopped off at Bari in Italy and managed to secure some of St Nicholas’ holy remains; these remains were brought back to Ireland (by way of Normandy) and then buried in the churchyard adjoining the church of St Nicholas of Myra in Newtown Jerpoint; the two knights thought this to be a safe place for which to bury such a saintly personage. The family of De Fraine had a beautifully carved gravestone placed over the grave of the saint – the date being either 1200 or more likely in 1300 as the church had been established for some time already (1172), being built by William Marshall, earl of Pembroke and ancestor of the De Fraines’ family. Marshall, the son-in-law of Strongbow (Richard Fitzgilbert de Clare) also established the “new town” of Nova Villa Juxta Jeripons situated opposite the mid-12th century Cistercian abbey of Jerpoint, in 1200, at which time he also built the little church dedicated to his favourite and esteemed patron saint, Nicholas of Myra. The grave of St Nicholas and the adjoining church became a place of pilgrimage from the 13th/14th century onwards, as was the saint’s holy well close by the churchyard; however, in c1680 the village of Newtown was abandoned and the little church with its famous grave left to fall in to steady decay and ruin – its ruined tower, walls and gallery now almost obliterated by trees and foliage – the gravestone of St Nicholas cracked across the middle. But its beautiful carvings survive. 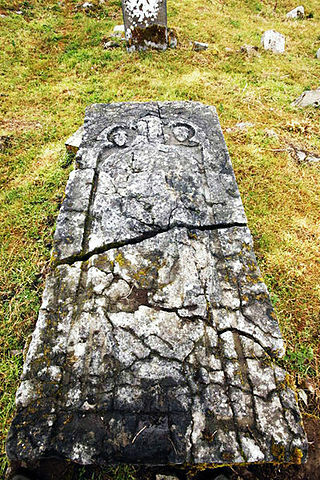 The bishop or cleric on the large, cracked gravestone wears a robe that is shaped like a crusader shield, while at the top two carved heads at either side of the saint’s head are thought to be the knights who brought the remains from Italy to Ireland. At the upper left-side a carving of a boat and at the opposite (upper right-side) a sun carving; there is also a carved cross with more intricate stuff around it and what may be a French fleur de lis. A Latin inscription can also be seen on the stone. The age-old legend of St Nicholas (Santa Claus) is known to most people. He was bishop of Myra (Mugla) in Lycia, Turkey, during the 4th century AD, and was well-known for his charitableness to the poor and the under-privileged, especially towards children; so much so that he came to be regarded as a “miracle-worker”. He is said to have died in 320, 342 or 350 AD, and his relics later (1084) translated to Bari on the Italian coast. According to the legend, Nicholas “reputedly gave three bags of gold to three girls for their marriage dowries” (Farmer, 2004). These dowries were tossed through an open window, or maybe down a chimney! and that is, perhaps, where the idea of Santa Claus putting gifts down a chimney comes in to its own. Another legend says that he ‘raised to life’ three boys who had been drowned in a brine-tub by a butcher” (Farmer, 2004). The author Colin Waters in his work ‘A Dictionary Of Saints Days, Fasts, Feasts And Festivals’ says of St Nicholas: “In early Europe it was traditional for people to leave gifts for others without saying who they were from on St Nicholas’ Eve (5th December). This was said to have been started by St Nicholas (also Klaus, Klass etc) when he was bishop of Myra in Lycia.” Waters goes on to say: “He is also patron saint of all prisoners and of all travellers, merchants and those overtaken by sudden distress or danger. His emblem is three balls, indicative of the gold he so freely gave away as a rich man. Panbrokers adopted his symbol. He is represented by three children in a tub.” St Nicholas is patron St of Russia and of Galway city. There are many churches dedicated to him in Ireland, including the medieval collegiate church of St Nicholas in Galway city which dates from c1320 – said to be the largest parish church in Ireland. The grave of St Nicholas at Newtown Jerpoint, Co. Kilkenny, has been mentioned by many Irish antiquarians and historians, including Canon Carrigan and Owen O’Kelly in his esteemed work ‘A History of County Kilkenny’. And interestingly, this tale has appeared regularly in the ‘Ireland’s Own’ magazine, being authored by Gerry Moran. Moran, Gerry., ‘Santa Claus is buried in Kilkenny’, Ireland’s Own, Wexford, Ireland, (various dates). O’Kelly, Owen., A History of County Kilkenny, Kilkenny Archaeological Society, Kilkenny, Ireland, 1969-70. Waters, Colin., A Dictionary Of Saints Days, Fasts, Feasts And Festivals, Countryside Books, Newbury, Berks, 2003. Categories: Inscribed Stones, Misc Subjects | Tags: Grave of St Nicholas at Newtown in Co. Kilkenny in Southern Ireland | Permalink. It’s really a nice helpful section of information and facts. I’m delighted that you just contributed this convenient details with us.. spiritual healer Remember to be us all well informed like this. Many thanks for giving. Thankyou spiritual healer for your kind comment.